Most of the new models are in and I'm becoming less impressed with the Christmas Eve storm. I've looked over four of the new model runs available tonight (NAM, GFS, RPM and the GEM). The majority of them are taking the storm further south much like my trusted European model has done for the last couple of days. This means we would stay all snow for the event. This also means that we would not get as much snow either. For the snow lovers, here is a look at the model bringing us the most snow, the NAM. This is showing snow accumulation from tonight through 6am Saturday morning (Christmas morning). It paints in 1" to 3" of snow for parts of southeast Missouri, western Kentucky, and lesser amounts in southern Illinois. I need to remind you that the image above is NOT my nor the Heartland StormTeam's snow forecast. It is just an output from an individual computer model run. And as I said above, the model shown above is the model with the most snow. This doesn't mean we will see this much. The models all seem to agree on slowing the system down, bringing the precipitation in during the second half of Friday or Friday evening versus earlier Friday morning. I am still on the fence as to what we will see from this system. Do I think we could see some snow from it? Yes. Will it be a lot? I'm not sure yet, but the chances are looking less and less likely. 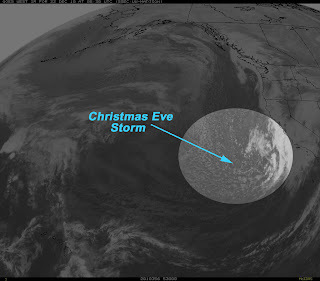 As mentioned in previous posts, the storm is still out over the Pacific Ocean. (See above) It should begin to move onshore overnight. As it gets over land tomorrow morning, the models should be able to get real data on the storm and then begin to crunch away at the calculations. I wouldn't be surprised to see some changes to the track and behavior of the storm in the models once the new data is ingested. The other thing we'll have to watch is how the storm appears after it is ejected out of the Rocky Mountains Thursday.